Synopsis- Sometimes life takes you on a journey you never expected . . .
Alice Ferguson is eight years old when a savage bushfire tears her family apart and she is sent to live with her aunt in the tiny town of Billabrin. Lost and lonely, Alice finds comfort in the beauty of the outback. As her confidence grows she dreams of creating her own home and of one day breeding the best wool in the country. Alice’s strength and spirit take her far from her roots and the land she loves. As tragedy strikes again, Alice must summon every ounce of her will to keep her dream alive, but nothing can prepare her for the treachery of her jealous cousin or the betrayal of the only man she ever loved. 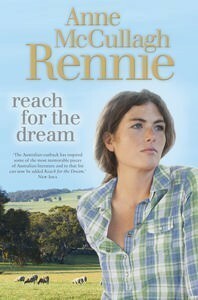 Review- Reach for the Dream is a saga set in the 1950’s- 1960’s that spans the life of (fictional) rural girl Alice Ferguson from aged eight years until her late twenties. After a tragic event leaves her motherless, Alice and her brother Ben are sent off to live with their Aunt, Uncle and cousins while their father grieves the loss of his wife. While Alice develops a strong bond with her Aunt Bea, the relationship with her cousin Katie is far from affectionate. Katie is jealous of Alice’s relationship with her mother and the way her bright and determined view of the world attracts a lot of suiters. She makes life difficult for Alice from very early on and this tumultuous relationship continues into their adolescence when they fall in love with the same man. Robert and Alice develop strong feelings for each other following a misunderstanding (instigated by Katie) and begin to make plans for their future. But her cousin’s unexpected pregnancy throws a spanner in the works and Alice and Robert are torn apart by the expectations of the society and their families during this time. Alice travels to England where she pursues scientific investigations and starts a new life. She is a strong and determined woman and people (especially men) seem to flock around her and no matter what gets in her way, she continues to push forward and follow her dreams. She’s hard working and determined to live a life on the land which was quite unusual for women during the 1960’s. While Alice and Robert continue to lead separate lives with different partners, their love for each other survives and in essence this is a story about two young people finding their way back to each other. Unfortunately it takes 400+ pages to get there which I found really frustrating! I don’t think I even finished the last book by this author that I attempted (Songs of the Bellbirds) and I found the last book of hers (Under Southern Skies) difficult to immerse myself in due to the young age of the protagonists. The author certainly does write sagas! In Reach for the Dream, we are introduced to the protagonist, Alice Ferguson at just age 8. She’s a resilient young girl who experiences much suffering and struggles that no young child should have to go through. However, I did expect that after the first chapter with the tragic circumstances of the fire that that story would then jump ahead a few years… but it continued on immediately after this moment and went into detail about her life after these events. For this reason I found it really hard to get into the rhythm for the story. Partly because of my expectations of where I felt the story should go, but also because in my opinion the story starts way too early. I felt that some of these early experiences could have been intertwined into the story through flashbacks…. Or to just include the first chapter and then jump ahead. Perhaps it was just my own impatience that I wanted to get into Alice’s story as an adult, to discover how those early experiences impacted on her life later on. While there were many elements of this story that I liked (Alice’s strength and determination) there were many things about the storyline and characters that also frustrated me. I felt that her cousin Katie was portrayed as selfish and pretty evil at times. However, I felt that her character was quite one-dimensional and there wasn’t really a realistic exploration of why she behaved the way she did or why she disliked Alice so much. I also found it difficult to believe that everyone knew how manipulative she was and yet they continued to listen to her lies. Alice, at times, also didn’t feel like a wholesome character. I think she displayed a real strength and determination to move forward no matter what adversity she faced, but I did find it a bit unrealistic that everyone she came into contact with (except her cousin) fell in love with her. I’d have liked to see Alice have a weakness, something that I could relate to. It also really took a long time for Alice to take charge of her life and follow her dreams. It’s obvious that my views on Reach For The Dream are mixed. On the whole I did like the story and after a rocky beginning I did manage to read it quite quickly. However there were elements of the story and the character development that I found difficult to relate to or find believable at times and this affected my overall experience of the story. One thing I could most definitely relate to (since I’ve recently relocated to a rural town) was Alice’s love of the land. This was something I could really appreciate. For those more patient than me that enjoy a lengthy saga in a rural setting, then Reach For The Dream may just be the right kind of read for you.